Some marshes in the area are dryed out. 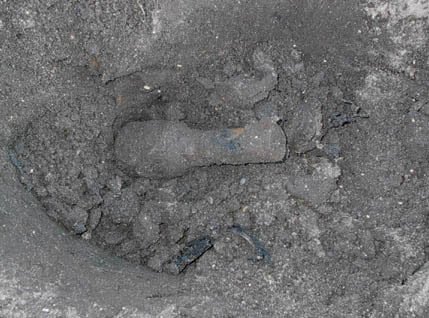 Digging is easy, like in butter, also there are no roots, no corks, nails, cans and other subjects that interfere with using a metal detector. We have delayed digging in marshy areas until October to avoid the mosquitos. Items recovered from a marsh are in a good condition. With cleaning this Soviet grenade would look like new. We don't pick up grenades with no launch pin. We burried this grenade. First item is Soviet vaseline. Some left and even have an original smell. Vaseline is still produced in the same packaging today. 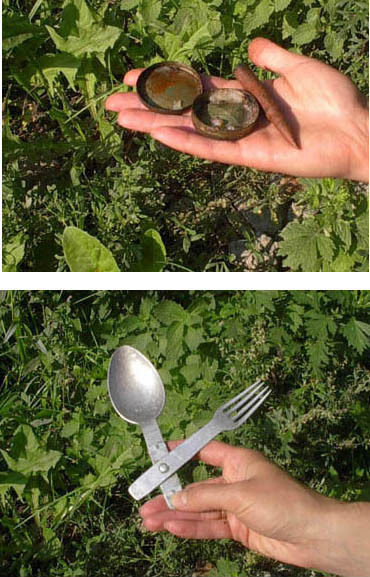 Aluminium spoon and fork is standard German army set. 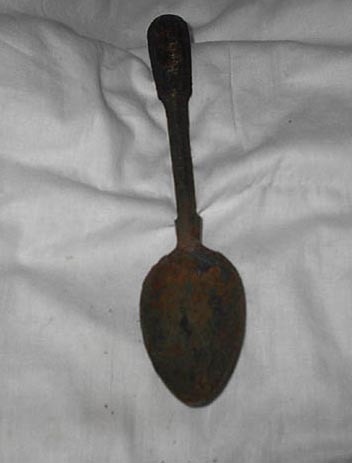 The spoons are often found at Soviet positions, the Soviet soldiers were throwing their heavy spoons away and taking trophies. So did I. Now, I carry the aluminium set on campings and big soviet iron spoon that was found in Bukrin is retired.